Aroid Forum: tall Alocasia 'Calidora' with a "pseudotrunk"
tall Alocasia 'Calidora' with a "pseudotrunk"
is about 7ft tall with about 5ft of "trunk"
> Subject: [Aroid-l] tall Alocasia 'Calidora' with a "pseudotrunk"
Yes, some Alocasias do grow tall. I THINK that on this list, and only just recently, Pete Boyce was describing how, in the wild, the falling leaves keep up with the vertical growth of an Alocasia rhizome/''trunk'', and that many Alocasias eventually die when potted because the grow too tall and there is no humus being deposited around the rhizomes for them to send new roots into. I THINK he also said that many species sort of ''fall over'' naturally and grow horizontally along the ground. He said to try growing them in a pot about 1/2 full of medium, and adding old leaves around their rhizomes as they became taller. We find the same thing/problem with Neotropical Xanthosoma sps., the equiv. to the Asian Alocasias. > is about 7ft tall with about 5ft of "trunk"
either falls over or declines, and the top dies off. > naturally and grow horizontally along the ground. > rhizomes as they became taller. > Xanthosoma sps., the equiv. to the Asian Alocasias. > > is about 7ft tall with about 5ft of "trunk"
I have noticed the same thing in Hawaii...but, I did not know why these things got so large and then declined...I assumed it was part of their natural history...not so much a horticultural issue. Although we also have nematodes and that loomed in my mind. Add Alocasia'Sarian', to the large pseudotrunk Alocasia that get large and fall over and decline. I will mound leaf litter on my other plants and see how that works. Thanks Julius for great advice...again. > Subject: Re: [Aroid-l] tall Alocasia 'Calidora' with a "pseudotrunk"
> either falls over or declines, and the top dies off. > > naturally and grow horizontally along the ground. > > rhizomes as they became taller. > > Xanthosoma sps., the equiv. to the Asian Alocasias. 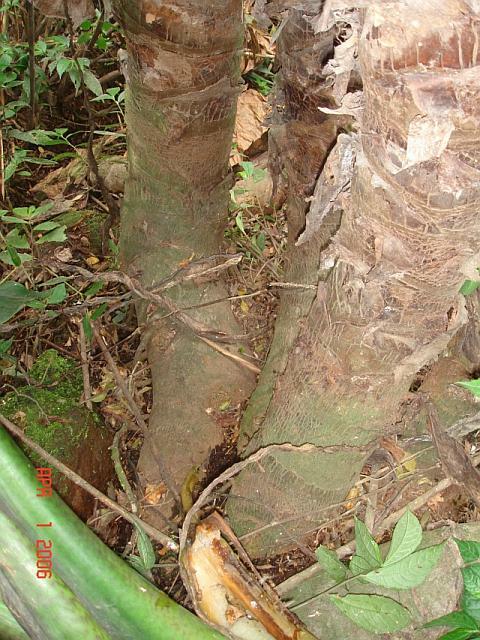 pseudotrunk (derivided from pseudostem); this is a true stem (or 'trunk'). erect stems long enough to become leaf-less. Subject: Re: [Aroid-l] tall Alocasia 'Calidora' with a "pseudotrunk"
>> naturally and grow horizontally along the ground. >> rhizomes as they became taller. >> Xanthosoma sps., the equiv. to the Asian Alocasias. 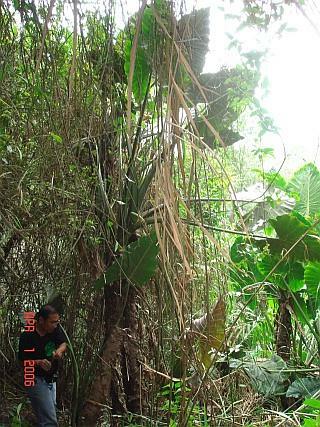 >> > is about 7ft tall with about 5ft of "trunk"
I encountered this tall A. macrorrhizos 2 years ago in habitat. >is about 7ft tall with about 5ft of "trunk"
You are correct...I took the term and ran with it. It certainly is not an herbaceous banana stem we are talking about. Thank you for pointing this out. The new Alocasia sounds very strange...was it from an area newly or rarely botanized? 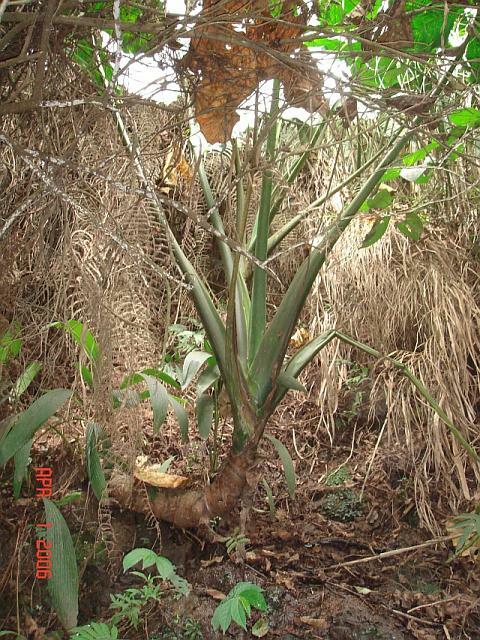 It is amazing that such a large plant has not been recognized earlier. Is it an understory plant or is it found in an open habitat? I have a difficult time visualizing this thing...regarding the almost leafless, terminal tuft...the petioles and lamina are large...how many leaves are in the tuft? > erect stems long enough to become leaf-less. > > either falls over or declines, and the top dies off. > >> naturally and grow horizontally along the ground. > >> rhizomes as they became taller. > > Subject: [Aroid-l] tall Alocasia 'Calidora' with a "pseudotrunk"
>their rhizomes as they became taller. >equiv. to the Asian Alocasias.